The movement for the right to the city has developed as a response of social groups and civil society organizations in an attempt to ensure better access to and opportunities for everyone living in cities, especially the most marginalized and deprived sections. Social movements and organizations from across the world worked together to develop a World Charter on the Right to the City that is also supported by UNESCO and UN Habitat, among other agencies. This global movement has also led to mayors in different cities, independently and collectively, adopting charters to promote human rights in cities. 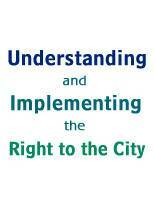 What Does the Right to the City Mean? 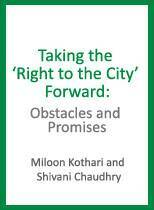 The concept of the right to the city is a means to combat the exclusionary development, selective benefit sharing, marginalisation, and discrimination rampant in cities today. The implementation of the right to the city needs to be grounded in the basic human rights principles of: non-discrimination; indivisibility of human rights; gender equality; progressive realisation; non-retrogression, subsidiarity; solidarity; and, cooperation. Item phasises priority attention to person sand groups in situation of vulnerability, including the homeless/landless, children, persons with disabilities, religious and sexual minorities, older persons, informal sector workers, Dalits/members of Scheduled Castes, indigenous and tribal peoples, persons from economically weaker sections, single women, and women-headed households, among others. 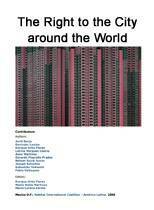 It also stresses responsibility and sustainability as core principles. The adoption and implementation of a strong human rights - based approach is the only way top reserve and up hold the dignity of all residents of the city, and to address the multiple violations and problems being faced by millions in cities across the world today.